Date night is one of my favorite excuses for dressing up! It gives you the opportunity to wear an outfit you may not ordinarily wear during the day and also allows you to experiment with items in your wardrobe. Accessories are my favorite to play up during a date night look. 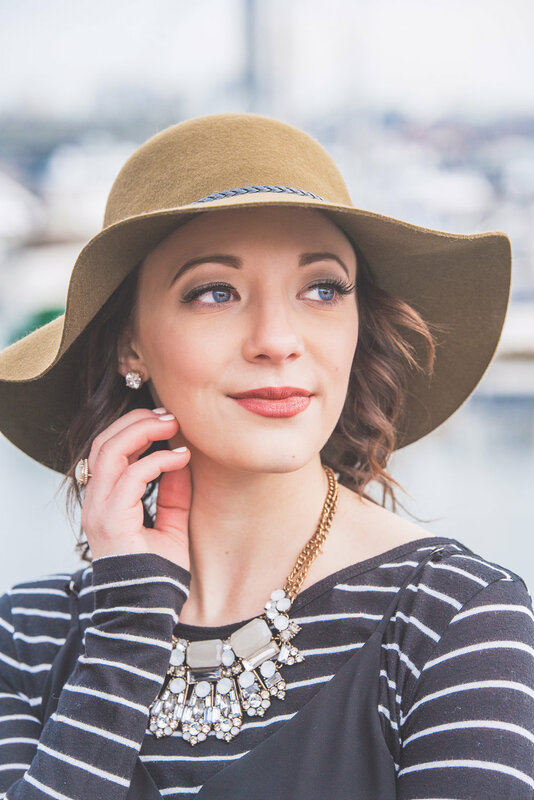 In one of my new favorite date night looks, I'm sharing how accessorizing with my Gigi Pip Annabella Olive Green Floppy Hat in my final look of this collaboration series not only compliments my evening attire but makes a feminine and fabulous statement. Winter temperatures can make it difficult to wear date night dresses due to the fact they are typically more on the lightweight side. Well, I'm happy to share my secret to success with you: LAYERS. I have been eyeing the layering a dress over a long sleeve top or sweater trend for a while and I thought it was genius as it allows you to wear items from your wardrobe all year long. The key to success with this trend is finding a complimentary top and dress. In this outfit, I gravitated toward a pattern and solid. My Nordstrom striped long sleeve fitted shirt worn underneath my Brass Plum flowy black dress (a summer favorite) is harmonious in appearance all while the layers keep me warm. For shoes, my Halogen black studded heels make their appearance once again as they are my favorite date night shoes because they really go with everything. Accessories as I mentioned, are my favorite part of date night outfits -- you can never go wrong with a statement necklace. My Forever21 metallic gold and silver necklace paired with diamond stud earrings and my Daisy Solitaire Kendra Scott ring provide some sparkle to my look. I'm more of a minimalist when it comes to jewelry, but for date night, I tend to layer on more pieces. My Gigi Pip floppy hat is the perfect piece to finish off this look as it brings a pop of color to my outfit. As I've mentioned in my previous two styled hat posts, this hat is 100% wool felt, so it also does the trick to keep me warm on winter days. 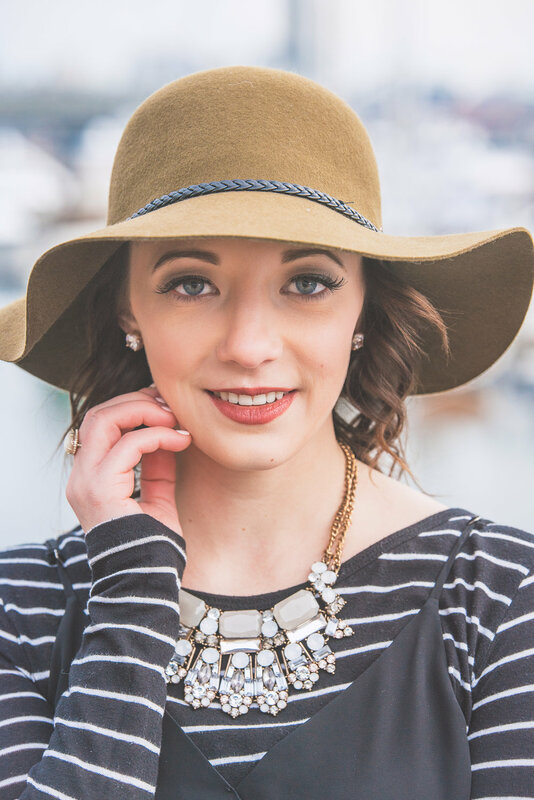 A floppy hat is the ideal date night accessory in my book. It can be taken on or off depending on the occasion and no matter how you wear it, it will always make a bold and fashionable statement for date night.